Home » In Love? Share Your Poems With The Community! In Love? Share Your Poems With The Community! Poems of Love v2 iPhone App Review. You don’t have to be a poet to be in love and write down your feelings in verse. When “I love you” isn’t enough anymore, you resort to the moon and stars and jot down your feelings. You’ll know the feelings are shared when you gaze upon your loved one’s face as you read the poem. You’ll be so happy you’ll want to share your love and your poem with the world. There’s an app for that too! 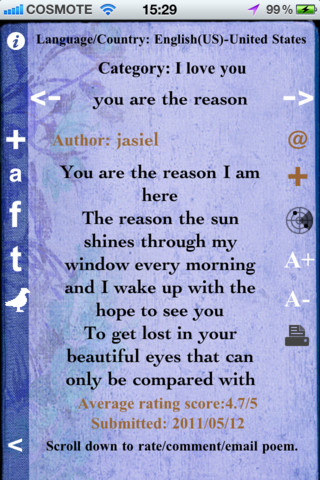 It’s called Poems of Love and it’ll bring you the vastest collection of love poems to your iPhone. With Poems of Love, you join a community of others like yourself. People are head-over-hills in love with someone and they are not afraid to share their feelings with everyone. Poems of Love is a vast library of poems written not by poets, but by others normal every-day people. The poems come in over 30 languages, neatly organized in 30 different categories, all having love as the theme. Whether it’s Cyber Love, Rekindled Love, Mother Love or Patriotic Love, it’s guaranteed that your verses of love will find a place in this app. The first thing you need to know about Poems of Love is that you’ll need an internet connection to read poems, as they are all online. The app will only act as a portal to the online library. You can either read poems or write one yourself and share it with the world. 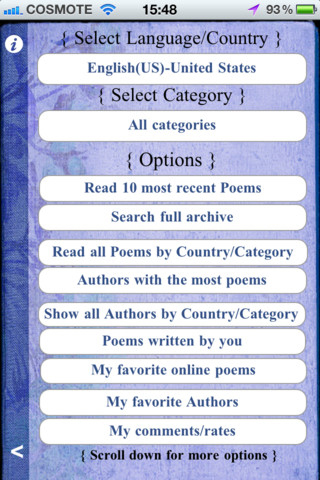 In order to read poems, make sure you’re connected to the Internet, and hit the Read online poems button in the app. You’ll then need to choose your language and a category, and off you go. 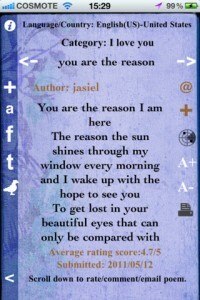 You can read the most recent poems, search for a specific poem, read the authors with the most poems (by the way, the developer of the app currently holds the number 1 rank here with 230 poems, and the last 4 authors in the Top 10 only have 1 poem each), or read the poems written by you. 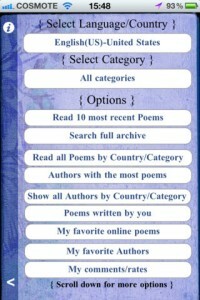 You can rate poems, share them on Twitter of Facebook and even SMS (although you need to create an account for these). In order to write poems, you’ll need an account, and in order to create an account you’ll need to write a poem. I know it sounds funny, but that’s the truth of it. When you try to write a poem, it makes you create an account. If you tap the Register button, it makes you write a poem and submit it. So, in the end, if you want to just read poems, without commenting or rating them, you don’t need an account. On the other hand, if you want to write a poem, share it by any means provided by the app or congratulate an author, you’ll need an account. One issue I think the developer (and especially the authors) should be aware of is that readers will be able to see the author’s email address and even email them, even though this is not outlined in the “terms” when submitting a poem to the store. I know Apple is big on privacy and the developer should be aware of this also. Poems of Love needs some lovin’ from the developer in terms of design as well. I’d love to see a more evolved interface than what it currently has. The functionality is there. The content is there. The design lacks and seriously damages user experience. 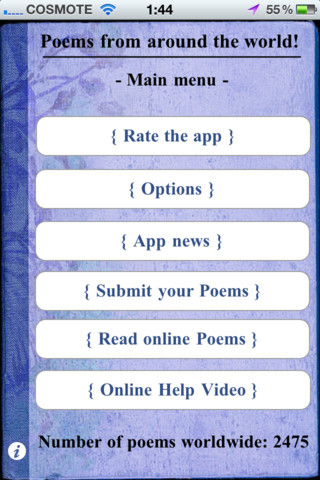 I give Poems of Love a 4/5 for its content and a generous 1/5 for its design and user experience. I hope the developer will be reading this, as I think Poems of Love can really be the best it can be with a (new) design. What do you think of Poems of Love ? Scroll down for our comment section and let us know! Forgot to say that the categories in the paid version which you reviewed are 70. Not only poems of love included. Thanks for reviewing my app. I really take into consideration your words. I really try to make this app better.